The California Lemon Law covers cars, trucks, SUV’s, vans, motorhomes, scooters and more. The law protects consumers by making the automobile manufacturer pay your attorney fees. The law holds automobile manufacturer’s accountable for multiple failed warranty repairs. This website gives you a complete understanding of the law, and how to make it work for you. Many consumers do not know that there is a lemon law, nor that they qualify for protection. You are entitled to your money back, including down-payment and monthly payments, as well as a payoff of the existing loan or lease balance. California’s Song-Beverly Consumer Warranty Act, more commonly referred to as the California Lemon Law was passed into state law over 39 years ago in order to provide relief to buyers of problematic vehicles in the State of California. The California Lemon Law applies to vehicles that were purchased or leased in the state of California wherein the auto dealerships have been unable to repair the vehicle within the warranty period after being given a reasonable number of opportunities (statutory specifics apply). For qualifying vehicles, the automobile manufacturer must take the vehicle back as a “lemon”, or replace the vehicle with a comparable model (if leased or purchased new) keeping the current lease or loan in place. A replacement vehicle under the California Lemon Law only occurs if both consumer and manufacturer agree to a replacement. The California Lemon Law also requires that the automobile manufacturer pay for the consumer's hourly attorney's fees and costs on a lemon law case. This makes the lemon law economically feasible for those who would otherwise not be in a position to hire an attorney. The California Lemon Law can cover any new or used vehicle that still has a manufacturer’s limited warranty still in effect. Many consumers who have purchased “manufacturers certified pre-owned” used cars do not know that they have the same rights under the California lemon law as do buyers of new vehicles. Some buyers purchase used vehicles without even knowing that the vehicle may even have been a “manufacturers certified pre-owned” to the previous owner, which is applicable to the present owner! Many vehicles have “hidden” or “secret” power-train warranties that a used car buyer does not readily know about. 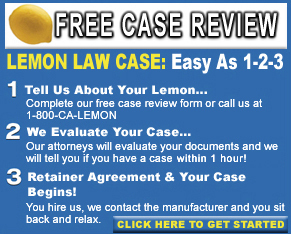 Your lemon law attorney can get this information as part of your lemon law case. Many consumers purchase from the dealer what they believe to be an “extended warranty”. This is a misnomer in the state of California. With the exception of one German high-end manufacturer, every other “warranty” that is administered by the dealer (whether factory or secondary market) is a “Service Contract”, and NOT applicable to California Lemon Law. Dealers *call* these “extended warranties”, as do consumers, but they are NOT. What about problems with dealer-installed, non-factory parts/accessories like alarms, wheel/tire packages, glass etch, paint protection, fabric protection, custom grilles, spray-in bed liners (for trucks), DVD/entertainment systems, custom paintwork, truck lift kits, and the like in regards to California Lemon Law? Non-factory items installed by the dealer are a matter between the DEALER and the CONSUMER, and not a responsibility of the automobile manufacturer. If a manufacturer agrees to repurchase or replace the vehicle under the California Lemon Law statute, the consumer does NOT receive any monetary reimbursement/ compensation for these items, as they are outside of how the vehicle was “as built” from the factory. Consumers are allowed (if no cosmetic damage/holes/etc. are left behind) to remove and keep these items, but if factory items were originally involved, then when the aftermarket (non-factory) item is/are removed by the consumer, the OEM (original part) must be purchased by the consumer and installed in place of the aftermarket item so that the vehicle is returned (surrendered) in “as built” condition. Also, vehicles must be returned with no cosmetic damage, worn-out tires, compromised windshield, scraped alloy wheels, etc. “Normal wear and tear” is acceptable, but varies in degree of interpretation by each automobile manufacturer. A good “rule of thumb” is the vehicle is inspected much like when a leased vehicle is checked-out at the end of the lease. The consumer, at the consumers sole expense, must correct the deficiencies/damage prior to returning (surrendering) the vehicle. A California Lemon Law claim/case is best left to the lemon law attorney, who is best equipped to deal with the automobile manufacturer by using and enforcing the word “law” behind the phrase “California Lemon Law”. Utilizing a lemon law attorney “levels the playing field” between consumer and manufacturer, and distances the consumer from the frustration of having to deal with automobile manufacturers, who would otherwise be happier if there were no California Lemon Law at all. Copyright © 2001 California Lemon Law Information .com. All Rights Reserved.